How Do You Destroy A Wasp Nest? When people are looking for a pest control specialist to remove a wasps nest, they are really looking for someone to remove the wasps themselves completely, rather than the actual nest. Once the nest has been treated with a professional grade insecticide, then all of the wasps will be dead within a few days at most. We can then make a further appointment at a later date to remove the empty nest if you wish. Contrary to what some people think the wasps nests are not reused year after year so even if the nest itself is left, for instance in a loft, then you wouldn't be troubled with wasps in that same spot in subsequent years. The first signs you have a wasp nest or other stinging insect like bees or hornets, is usually seeing more than one flying around within your home. Getting the occasional wasp in the house through an open window or door is inevitable especially in spring and summer, but seeing two or more in a room is a sign that you may have an entry point to a wasps nest near to that room. By going outside you can see if there are wasps flying near the eaves of the roof close to a top floor window. Occasionally the wasps nest can be heard before it is seen, as the nest might be within the attic and cannot be seen from the ground floor outside. Some people ask if a wasp nest can be left alone and just keep all their windows closed, but if we have a hot summer this is not a very effective solution and doesn't get rid of the main problem which is the flying swarms of wasps hovering around the area with a high risk of stings to yourself or your neighbours. The cheapest and riskiest way of getting rid of a wasps nest is to knock it down yourself with a stick, but you will have to be covered head to foot in professional overalls, and be wearing gloves and a full face mask, be safe on a set of ladders and not be daunted by lots of wasps attacking you. Unlike bees which sting once then die, a single wasp can sting multiple times and a medium size nest of wasps can contain anything from 500 and upto 5000 insects. 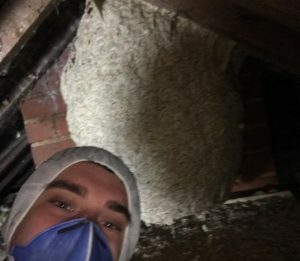 By searching online for wasp nest treatment you are looking for the best solution to stop the risks of wasp and bee stings and which is the safest for you, and that is to employ a professional Banbury pest control operator like Adam at Oscar Pest Control who is fully trained and qualified to treat wasps nests with professional grade insecticides. Breathing in spray or powder could cause an allergic reaction so don't risk a DIY disaster by having a go yourself and instead get Oscar Pest Control in to solve the problem for you affordably and quickly. 100% Guaranteed to remove your wasp problems.